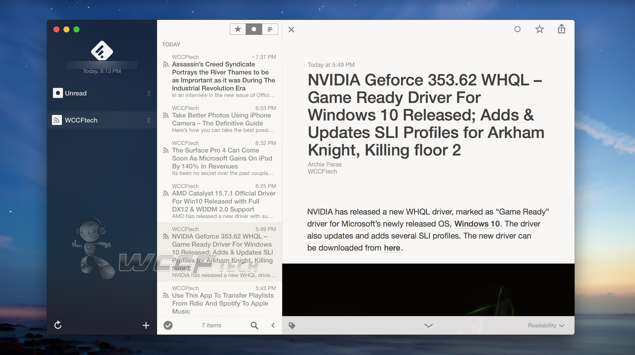 Reeder 3 public beta for Mac OS X Yosemite is now available to download. The freshly released beta build for users is absolutely free to try. With the sad demise of Google Reader, many third-party RSS alternatives have picked up momentum in the mobile and desktop space. If you take your RSS very seriously, then you would already know that how much popular Feedly and Reeder actually are, with the latter having a big following of its own, although currently only available on iOS and OS X. 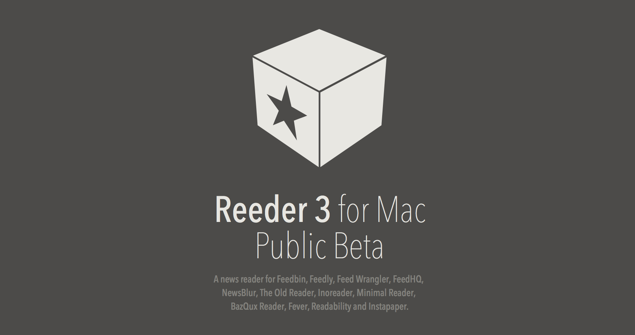 Today, the company has officially revealed its future plan for the Mac with the release of Reeder 3 public beta for those running OS X Yosemite. 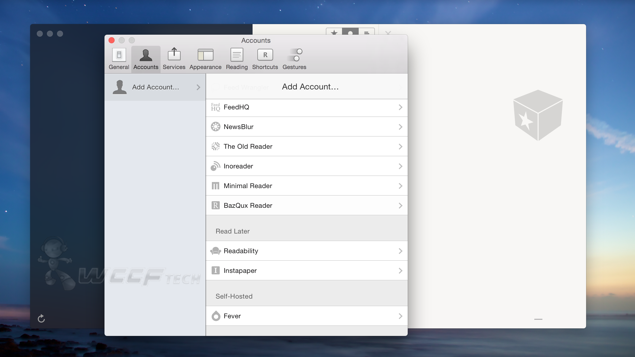 The first thing you’ll notice when you launch the newly designed Reeder 3 app is the interface. Designed to fit well with Apple’s modern UI aesthetics, users can expect plenty of blurs and sharply used fonts throughout. Apart from that, the app looks far more cleaner than before and there’s definitely less clutter, so the user can focus more on the content they’re reading rather than the machinery that’s churning stuff out. If you’re asking us, we’d give Feedly the thumbs up the most in the list of supported news reading services, but of course, your preference may vary. Both of the services integrate really well with the app, and makes consuming content a tad bit better. Since Reeder 3 is beta software, there are things that can go ‘wrong’ during your everyday usage routine. Expect crashes from time to time, and maybe a stutter or two at least expected moments. And like we mentioned before, Reeder 3 is in public beta and is absolutely free to download and try. 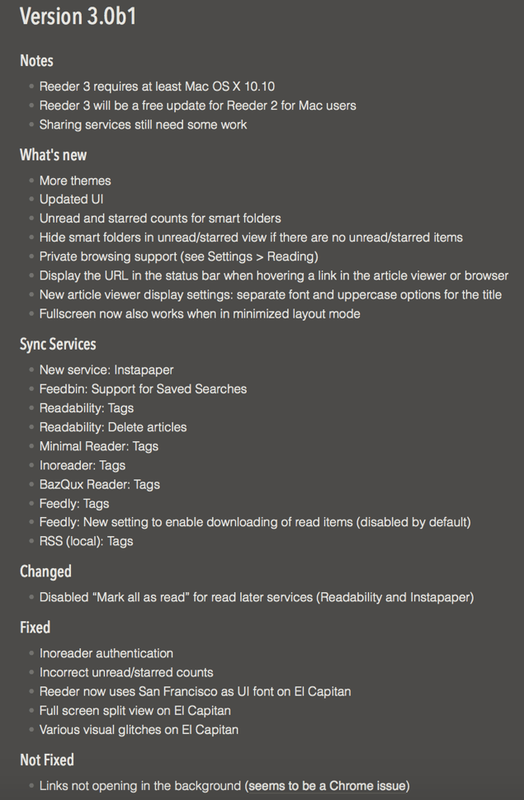 You can download the first beta of Reeder 3 from Reeder’s official website from here. Be sure to go through the changelog first in order to find out what will and might not work for you. If you do happen to take Reeder 3 beta for a spin, then be sure to let us know what you think about it in the comments section below. And oh, make sure you add us to your RSS feed as well, to keep yourself updated on our coverage.